I love the holiday season. I love the food, the decorations, the opening of packages, the camaraderie. I love shopping in my friends’ textile arts stores in Threadville. My friends and relatives say they like the quilted place mats, tea cozies, table runners, coasters, baby quilts, etc. that I send them every year. But I think I’ve inundated them, and this year, I’m doing something different. They’ll all be surprised when they open their heavier-than-usual presents from me and discover...books. Most of my friends and relatives love to read mysteries, so that’s really easy. I’m sending them mysteries written about my friends who post on this blog. Just look at the wealth of subjects and characters! I also love to receive how-to books for any sort of craft, cooking, or gardening. So I’m purchasing some of those, too. But now I’m down to the children. A friend has a son and a daughter. Four years ago, my friend’s son presented her with twin granddaughters, and three years ago, the daughter presented her with a grandson and another granddaughter. I’ve sent these children gifts since they were babies—quilts, fabric books, quilted stuffed toys, and, yes, even some clothing. This year, I’m thinking of buying them books. What books would three- and four-year-olds like? 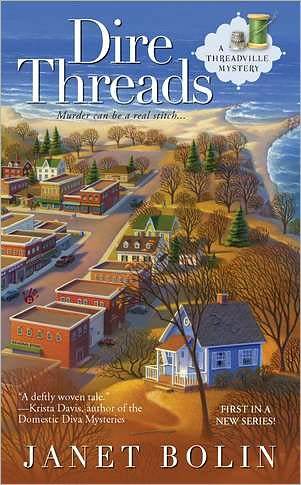 Today’s Have a Cozy Christmas Countdown giveaway is Dire Threads, the first in the Threadville Mystery series. A winner will be randomly drawn from the comments, so please leave a comment, and then come back tomorrow and check out the sidebar to find out who won. 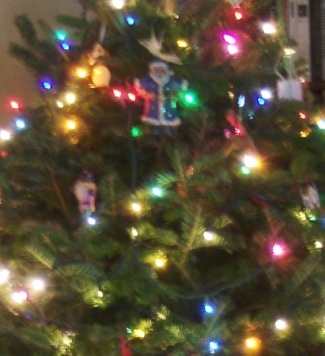 Remember that cozy mysteries make great gifts, and have a very cozy Holiday! DIRE THREADS was nominated for both an Agatha Award for Best First novel and for the Bloody Words Light Mystery Award (the Bony Blithe.) You can order DIRE THREADS and THREADED FOR TROUBLE from any bookstore or from these booksellers. Visit Janet at facebook and twitter. The third Threadville Mystery, THREAD AND BURIED, coming out in June 2013, can already be preordered from Amazon! Sounds like a great read. Please enter me in this giveaway..
My friend, Edward Kent, writes children's books about a nice Zombie named Ed. I'd recommend any of them. Personally I like Zombie Ed likes Halloween! There's also a good one about bullying-Stop Bullying Me! I'm a Zombie. So What? I loved the Golden books way back in the 40s and my sons loved them, too. I don't think they ever go out of style. I belong to a mystery readers club and we're always looking for new authors to read. I also loved the Golden books. Harold and the Purple Crayon is another favorite children's book. I think it is never too early to introduce kids to the joy of books. I would love to win this !!! She loves all the same books I do, sounds like my kind of gal. Would love to get to know her in this book. I'm always looking for a new mystery series, and this looks good. 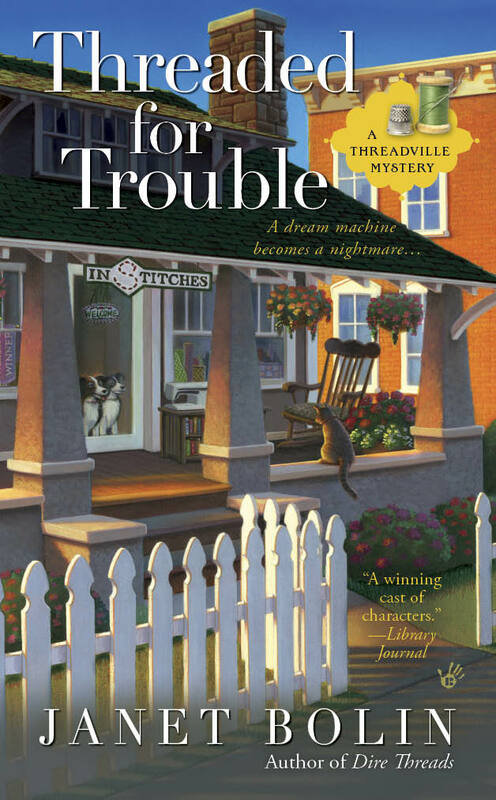 Sewing and mystery -- must read! As for books for young children, I am partial to anything by Eric Carle. It has been a long time since I had to worry about three and four year olds, but I think 'Cat in the Hat' and my all-time favorite 'Green Eggs and Ham' would be super choices. I'm an elementary school librarian and I think that some of the books my Kindergarten students like would be good for younger children as well: Fancy Nancy books by Jane O'Connor, Olivia the Pig series by Ian Falconer, The Pigeon books by Mo Willems, Eric Carle and Bill Martin are favorite authors, too. I would recommend The Charlie books by Ree Drummond. I even bought the Christmas book for the grandchildren I don't have yet! Books are wonderful gifts.....I would love as many as I can get. I have loved every book that Killer Characters has recommended. That's for all of your great writing. I love to receive books and to give them. There is nothing better than getting lost in a great book. The friends from my books think sending gifts that involve all our friends on this blog is an excellent idea, and they wonder why they didn't think of it. This sounds like a good read. I love the food and of course all the holiday cookies and candy. My sister, Janet, always gives me a bag of homemade chocolate cover pretzels. Yum!! I love getting books as gifts! I guess some of us just read so much that people don't know whats safe to buy for me but it's a GREAT idea! For little kids I'd buy a colorful, bright, big picture book that is totally theirs to do what they want with! GREAT IDEA!!! This sounds like a great book - I'd love to win a copy! I can't help you with the books for little ones, but I really do enjoy this series. I am glad it is continuing. I have enjoyed several cozy mystery series. Hope to win a new cozy. Anything by Dr Suess and also The Fly Went Bye. I also quilt and quilt shops are my favorite places to shop. At Quilting by the Bay in Panama City, FL they know me by name. I have no idea what children of that age read. I just became a stepmother of a now 14 year old, and she loves reading, so I've been buying lots of YA books for her. SO much fun, to sit together and read. 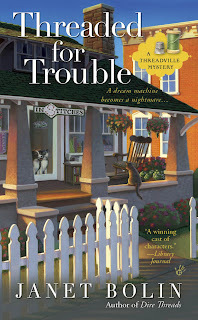 Thanks for the chance to win this cozy mystery, which is on my wishlist. yes please enter me in the contest. i have been wanting this book since i saw the cover! it is so beautiful. I work with 3 year olds. Books with colorful pictures depending on their interests. Books that make sounds. I'd love this! I'm interested in all the different types of cozy mysteries! I love this series and am looking forward to the next one! This is a fun series. I would love to win this book. Thank you for the chance. Oh how I would love to win!!!!!!!! Great title! Thank you for hosting this giveaway. I'm terrible about remember authors, sorry ladies, but I do remember the names and the names of series. The VEry Hungry Caterpiller, (Eric Carle) Horton Hatches the Egg, Are You my Mother? is a wonderful to read that talk to the children about how mothers look like their babies. The baby bird falls out of the nest and looks around for his mother, asking a cow, an airplane, and a dirt mover if they were his mother. All the dirt mover says is Snort. The baby bird says, "You are not my mother! You are a snort!" One series that I really love is called A Boy, a Dog, and a Frog. These books have no words, so the kids can make up the words. The drawings are very detailed and kids love them. Finally, Harold and the Purple Crayon. THese were books that the kids loved when I taught preschool Deaf children. Sounds like a fun one! Please enter me in the drawing. I'm looking forward to this series. Please enter me in the draw. I love to give books as gifts and fortunately my family and friends all like to receive them. I'm a children's librarian (preschool) and my children enjoy books of all kinds. Many 3 and 4 year olds (especially boys) like train and trucks and anything about construction or dinosaurs. The Bill Peet books might be a bit advanced but have wonderful words, illustrations and messages. And everyone likes Arthur, Clifford and Dr Seuss! I love books as gifts (or prizes)! Bookstore gift cards are good alternatives, as well, to avoid duplication. And for kids, it could be presented as an exciting trip to a bookstore to look for the books and buy them with the card. I've been wanting to start this series, and would love to win the book. I like to sew and this book would be of interest to me. Would like to win it. I just love cozy mysteries. I also love to get and give books. This new series is going on my list! I enjoyed the first 2 books by Janet Bolin and am looking forward to the third. So many of the authors listed on Killer Characters are the authors I keep a close eye out for new releases. Thanks for this great month long contest. Please enter me today. Books are a great gift idea for children. With all the electronics we have today, reading is becoming a lost art. All of my grandchildren are always playing on their gaming systems or on their Ipod. For me give me a good mystery and I'm happy. Love cozy mysteries. Looks like a good book. and I always think that an inscription is nice, then they can always remember who gave them that book. I'm not sure what books would be best for a three-or-four-year-old. Now if you were talking nine-ish, I might could help you out. Everybody should read some Hardy Boys & Nancy Drew. If you want something more modern I have to recommend Last Shot: A Final Four Novel by John Feinstein. Fantastic mystery that also mixes in journalism. I love to give books, and fortunately, most of my grandchildren love to read. (All past the three and four-year age.) Of course, I love to receive them too! I do love these killer characters! I can't think of a nicer thing to find under the tree than books! The next best is gift cards for book stores! Nice giveaway month! Mem Fox writes beautiful & amazing stories for children. WOMBAT DIVINE is an excellent Christmas read. Books are a great gift! And this sounds like a fun series!!! In the case of Beatrix Potter, my late mother gave that collection to my daughter when she was three. We read the stories over and over. We still have it and I fully intend to pass it on to my granddaughter when she turns three. In terms of the two Jan Brett books, my daughter loved those books from the time she was about the same age. We read them for many years, first so Grace could see the colorful drawings, then for the stories themselves, and then when Grace started taking painting lessons, she studied Jan Brett's beautiful and detailed illustrations. These are all wonderful, magical books. My favorite gift to receive is a book. I love reading and have since I was a child. I love cozies so much so this would wonderful to win one that is the beginning of a series. Usually if I get hooked on the characters, I go back and buy the rest but I am sure that miss something by not reading them in order. Hard for me to figure out a git for my brother. He is severely autistic and sometimes a gift makes a great hit with him other times, he looks at it and lays it down. Fingers crossed that I can find him something he loves this Christmas. Books are the best gifts! Give those children wonderful books and help get them hooked at an early age. My budget has always allowed for books for the family. WOuld love to win a new book.